Technical drawings are also known as ‘engineering drawings’. They are means of communications and convey technical information of plant and equipment. They describe three-dimensional objects through the medium of two-dimensional paper. The process of producing technical drawings, and the skill of producing those, is often referred to as ‘drafting’. Technical drawing is normally accepted as legal document and is frequently being used for regulatory approvals. Technical drawings are most frequently used to establish engineering requirements. They describe typical applications and minimum content requirements. They are standardized tools of graphical language which avoid verbal exchanges. They are used and understood by the technical personnel speaking different languages and belonging to different countries and cultures. Technical drawings are prepared in such a way that they convey complete information of the plant and equipment clearly and concisely. They often contain more than just a graphic representation of the subject. They also contain dimensions, notes and specifications. Clarity is the essential aspect of the technical drawings. They normally represent two dimension view of the object though some drawings also provide three dimensional views. They are prepared either manually or with the aid of computer. They are generally prepared or printed in standard size of paper. Except a few category of drawings (e.g. process flow diagrams, control diagrams, piping and instruments diagrams, and single line diagrams etc. ), all the drawings are normally prepared in plan and different section views usually to the scale in order to provide complete information of the drawing object. Often help of standardized symbols are taken in the drawing for depicting certain equipments or instruments. Those informations which cannot be given in the plan and sections view such as material specification, tolerances, and bill of materials etc. are normally given in a tabular form on the drawing usually on the right side or bottom of the drawing. Technical drawings carry a ‘title block’ in the right bottom corner for their identification. The title block includes (i) title of the drawing, (ii) type of drawing, (iii) drawing number and revision number, (iv) date of the preparation, (v) scale of the drawing, (vi) measurement unit, (vii) name of the organization who prepared the drawing, (viii) name of persons who prepared and approved the drawing, and (ix) any other information which is needed for the drawing identification. Technical drawings can be categorized into many types. Different types of drawings are described below. A ‘general layout drawing’ is normally prepared in plan-view. It describes (i) entry gates and plant boundary, (ii) plant approach roads, (iii) location of the plant, equipment and facilities, (iv) provides the linkages between the plant equipment and facilities, (v) road and rail movements, (iv) conveyors and pipeline routings, (vi) critical and regulatory clearances if required, (vii) location of chimneys and stacks, and (viii) green belts. The drawing is usually prepared to the scale with building dimensions. A layout drawing depicts design development requirements. It is similar to a detail, assembly, or installation drawing, except that it presents pictorial, notational, or dimensional data to the extent necessary to convey the design solution used in preparing other engineering drawings. The layout drawing normally does not establish item identification. The layout drawing is prepared either as (i) a conceptual design layout to present one or more solutions for meeting the basic design parameters and to provide a basis for evaluation and selection of an optimum design approach, (ii) a design approval layout to present sufficient details of the design approach for cost estimating and design approval, (iii) a detailed design layout drawing depicting the final development of the design in sufficient detail to facilitate preparation of detail and assembly drawings, (iv) a geometric study to develop movement of mechanical linkages, clearances, or arrangements. The layout drawing includes (i) location of primary components, (ii) interface and envelope dimensions including a cross-reference to applicable interface control documentation, (iii) paths of motion, (iv) operating positions, (v) critical fits and alignments, (vi) selected materials, finishes, and processes, (vii) cellars, pipeline routing and sizes, (viii) adjustments, (ix) critical assembly details and sequence, and (x) identification of change parts and critical spare parts. The layout drawing is not generally used to fabricate equipment. However, a detailed layout drawing is sometimes used for this purpose. A layout drawing is drawn to scale with sufficient accuracy and completeness for its intended use. It can also be used as an interim assembly drawing for development equipment. A general arrangement (GA) drawing depicts the physical relationship of significant items using appropriate projections or perspective views. Reference dimensions are to be included in GA drawing. The GA drawing does not establish item identification. It is prepared to convey a general description of the configuration and location of significant items. It is not normally used to control design. The GA drawing normally includes (i) sufficient views so that a general understanding of the configuration and location of significant items is conveyed, (ii) overall, locating, and other general dimensions necessary to describe the configuration, (iii) identities of significant items, and (iv) reference to applicable documents for further details. A detail drawing provides the complete end-product definition of the part or parts depicted on the drawing. A detail drawing establishes item identification for each part depicted thereon. It is either a mono detail drawing or a multi detail drawing. A mono detail drawing defines a single part. It is prepared to provide maximum clarity in defining the part. It describes all features of the part which include configuration, dimensions, tolerances, materials, mandatory processes, surface texture, protective finishes and coatings, and markings. A multi detail drawing defines two or more uniquely identified parts in separate views or in separate sets of views on the same drawing. It is a single drawing prepared to describe parts usually related to one another. A multi detail drawing is to be used cautiously. The same revision status applies to all details on a multi detail drawing and hence a change to one detail of the drawing can affect the associated records of all other details (material control data, manufacturing planning, and microfilm etc.). Some significant benefits are to outweigh this potential disadvantage, as well as such others as diminished clarity and usefulness resulting from increased drawing complexity. Assembly drawing defines the configuration and contents of the assembly or assemblies depicted thereon. It establishes item identification for each assembly. Where an assembly drawing contains detailed requirements for one or more parts used in the assembly, it is a detail assembly drawing. The assembly drawing is prepared for each group of items which are to be joined to form an assembly and that reflect one or more of the (i) a logical level in the assembly or disassembly sequence, (ii) a testable item, (ii) a functional item and (iv) a deliverable item. It is the preferred drawing type for an inseparable assembly. However, individual pieces of the inseparable assembly need not be individually detailed provided they are controlled by the specified assembly requirements or by separate detail drawings. The assembly drawing normally includes the following. Two or more parts, subordinate assemblies, or combination of these items. A parts list specifying the unique identifier for all items which become a part of the assembly. Requirements for decorative or protective finishes, processes, settings and adjustments, and other relevant data necessary to complete the item as an assembly. Depiction of the items in the assembly relationship, using sufficient detail for identification and orientation of the items. Normally details of a subordinate assembly are not repeated on the assembly drawing of a higher order. Electrical items depicted as they are to be mounted. However, small electrical items mounted by wire connections only may be located either by depiction on the assembly drawing or inclusion in the pertinent wiring list or connection diagram. Attached parts (bolts, nuts, and washers etc.) required to mount assemblies in next higher assemblies or on foundations are included in the parts list of the drawing which define the attachment (usually the higher level assembly or installation drawing). Assembly drawings may be tabulated by specifying variable items in the parts list. An erection drawing provides information for properly positioning and installing items relative to their supporting structure and adjacent items. This information includes dimensional data, hardware descriptions, and general configuration information for the installation site. The erection drawing is prepared to provide detailed installation information for (i) functionally related items (such as a control system, electrical system, or hydraulic system) which cannot be effectively shown on an assembly drawing of the item to which it belongs, or (ii) a part or assembly which is so large or complex that the major assembly drawing cannot accommodate all relevant data. An erection drawing normally includes (i) overall and principal dimensions in sufficient detail to establish space requirements for installation, operation, and servicing including clearances for opening of doors, removal of plug-in units and travel or rotation of any moving parts (including the centres of rotation, angles of elevation and depression), (ii) interface mounting and mating information (e.g. locating dimensions for attaching hardware), (iii) interfaces for pipe and cable attachments, (iv) information necessary for preparation of foundation plans including mounting details, (v) references to interconnecting and cabling data and to associated lists, (vi) identification of and requirements for installation items not included in the parts list of the using assembly drawing, (vii) reference to the assembly drawing of the major item being installed, (viii) a parts list specifying the items to be installed thus establishing item identification for a work package, and (ix) supporting structure or associated items which are not included in the installed items. The purpose of process flow diagram (PFD) is generally (i) to show the plant design basis indicating feedstock, product and main streams flow rates and operating conditions, (ii) to identify the scope of the process, (iii) to show graphically the arrangement of major equipment, process lines and main control loops, and (iv) to show utilities which are used continuously in the process. A PFD normally comprise of but not limited to (i) all the process lines, utilities and operating conditions essential for material balance and heat and material balance, (ii) utility flow lines and their types which are used continuously within the battery limits, (iii) equipment diagrams to be arranged according to process flow, designation, and equipment number, (iv) simplified control instrumentation pertaining to control valves and the likes to be involved in process flows, (v) major process analyzers, (vi) operating conditions around major equipment, (vii) heat duty for all heat transfer equipment, (viii) changing process conditions along individual process flow lines, such as flow rates, operating pressure and temperature etc., (ix) all alternate process and utility lines operating conditions, and (x) material balance table for essential streams. A PFD normally does not include (i) minor process lines which are not usually used in normal operation and minor equipment, such as block valves, safety/relief valves, etc. unless otherwise specified, (ii) elevation of equipment, (iii) all spare equipment, (iv) heat transfer equipment, pumps, compressor, etc., to be operated in parallel or in series (usually shown as one unit), (v) piping information such as size, orifice plates, strainers, and classification into hot or cold insulated of jacket piping, (vi) instrumentation not related to automatic control, (vii) instrumentation of trip system, (viii) drivers of rotating machinery except where they are important for control line of the process conditions, and (ix) any dimensional information on equipment, such as internal diameter, height, length, and volume. Internals of equipment are shown in PFD only if required for a clear understanding of the working of the equipment. A piping and instrumentation diagram/drawing (P&ID) is a detailed diagram in the process plant which shows the piping and vessels in the process flow, together with the instrumentation and control devices. It is the primary schematic drawing used for laying out a process control installation. It is a diagram which shows the interconnection of process equipment and the instrumentation used to control the process. Normally a standard set of symbols is used to prepare drawings of processes. A P&ID usually includes (i) instrumentation and designations, (ii) mechanical equipment with names and numbers, (iii) all valves and their identifications, (iv) process piping, sizes and identification, (v) miscellaneous such as vents, drains, special fittings, sampling lines, reducers, increasers and swagers etc., (vi) permanent start-up and flush lines, (vii) flow directions, (viii) interconnections references, (ix) control inputs and outputs, (x) interlocks, (xi) interfaces for class changes, (xii) seismic category, (xiii) quality level, (xiv) annunciation inputs, (xv) computer control system input, (xvi) vendor and contractor interfaces, (xvii) identification of components and subsystems delivered by others, and (xviii) intended physical sequence of the equipment. P&ID is normally drawn up at the design stage from a combination of PFD, the mechanical process equipment design, and the instrumentation engineering design. During the design stage, the diagram also provides the basis for the development of system control scheme. P&ID also plays a significant role in the maintenance and modification of the process after initial build. It is also vital in enabling development of control and shutdown schemes, safety and regulatory requirements, start-up sequences, and operational understanding. It forms the basis for the live mimic diagrams displayed on graphical user interfaces of industrial control systems such as SCADA and distributed control systems. Control drawing is that drawing which is used for the control of certain activities. There are usually six categories of control drawing (Fig 1) as given below. 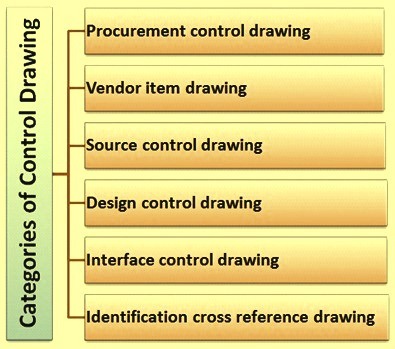 The first category of control drawing is the procurement control drawing. It provides criteria for performance, acceptance, and identification of supplier items by disclosing the engineering design characteristics required normally for control of interfaces and to ensure repeatability of performance. It is prepared to specify criteria for (i) purchased items, (ii) alterations to purchased items, (iii) selection from purchased items, (iv) development and qualification of new items, and (v) item identification. It includes (i) performance requirements to ensure that performance characteristics critical to the intended application are met, (ii) envelope dimensions to ensure physical interchangeability in using assemblies, (iii) interface characteristics to ensure functional interchangeability in using assemblies, (iv) qualification requirements necessary to verify that performance requirements and functional interchangeability, (v) identification requirements including marking, instructions, lot serialization, etc., (vi) procurement data, (vii) acceptance criteria, and (viii) to identify any variations between items. The second category of control drawing is the vendor Item drawing. It provides an engineering description and acceptance criteria for purchased items. It provides sufficient engineering definition for acceptance of interchangeable items within specified limits. It is used to provide engineering requirements for a purchased item. It is not the intent of a vendor item drawing to portray a complete design disclosure. This drawing discloses sufficient information to ensure identification and re-procurement of interchangeable items. The drawing includes (i) configuration, (ii) dimensions of item envelope and their limits, (iii) mounting and mating dimensions and their limits, (iv) interface characteristics and their limits, (v) acceptance criteria, (vi) performance, maintainability, reliability, environmental, and other functional characteristics, (vii) schematic, interconnection, or other appropriate diagram to define item function or provide inter-connection information. The third category of control drawing is the source control drawing. It provides engineering description and acceptance criteria for purchased items which need design activity imposed qualification testing and exclusively provide performance, installation, and interchangeability characteristics specifically required for the critical applications. It establishes item identification for the controlled items. It is used to provide a means of establishing engineering requirements for the selection, qualification testing, and acquisition of an item, and documentation to assure interchangeability of specified items. It includes (i) configuration, (ii) dimensions of item envelope and their limits, (iii) mounting and mating dimensions and their limits, (iv) interface characteristics and their limits, (v) acceptance criteria, (vi) qualification test requirements, (viii) performance, maintainability, reliability, environmental, and other functional characteristics, (ix) schematic, interconnection, or other appropriate diagram to define item function or provide interconnection information, and (x) identification requirements including marking instructions. The fourth category of control drawing is the design control drawing. It discloses the basic technical information and performance requirements necessary for a contractor to complete the detailed design required to develop and produce an item. The drawing in itself does not provide complete design for which a detailed design drawing is needed. It includes those details which are necessary to develop the detail design of the item such as (i) configuration, mounting, mating, and other necessary dimensions, (ii) performance, installation, reliability, and interchangeability requirements, (iii) test requirements, (iv) schematic, connection, or other appropriate diagram (if electrical, electronic or other circuitry is involved), (v) the mating connections, their location, and a connection diagram, and (vi) reference to other documentation. The fifth category of control drawing is the interface control drawing. It depicts physical and functional interfaces of related or co-functioning items. It does not establish item identification. This drawing controls one or more of the interfaces such as mechanical, electrical, interconnections, configuration, installation, operational sequence requirements, and system switching etc. The drawing includes (i) configuration and interface dimensional data applicable to the envelope, mounting, and interconnection of the related items, (ii) complete interface engineering requirements (mechanical, electrical, electronic, hydraulic, and pneumatic etc.) which affect the physical or functional characteristics of the co-functioning items, and (iii) any other characteristics which cannot be changed without affecting system interfaces. The sixth category of control drawing is the identification cross reference drawing. It is an administrative type drawing which assigns unique identifiers which are compatible with automated data processing systems, item identification specifications, and provides a cross reference to the original incompatible identifier. It does not specify any engineering or design requirements beyond those already contained in the drawings, and specification etc. governing the original item. The mechanical schematic diagram depicts mechanical and other functional operation, structural loading, fluid circuitry, or other functions using appropriate standard symbols and connecting lines. It is a design information drawing. It is made when operating principles cannot be readily determined from a study of the assembly drawing. It illustrates design information for (i) hydraulic or pneumatic systems, (ii) complex mechanical systems (complex arrangement of gears, clutches, linkages, and cams, etc. ), (iii) rigging instructions, and (iv) critical structural items to display loading or lifting data. A mechanical schematic diagram symbolically depicts elements of the unit, assembly, or system involved and displays the relation of each element by interconnecting lines. The elements are usually arranged functionally or they are actually arranged as in their assembly or installed position. Loading diagrams for hoists and slings, flow diagrams for hydraulic or pneumatic control valves, and simple unit flow diagrams, etc. can often be combined with the assembly or installation drawing. Hydraulic or pneumatic system diagrams, complicated rigging diagrams, and complex mechanical function diagrams etc., normally require separate drawings. Civil drawing is used for specifying the shape and position of the civil foundation. It typically includes the information such as (i) setting out dimensions for the concrete structure on site, (ii) plans, sections and elevations showing layout, dimensions and levels of all concrete members, (iii) location of all holes, chases, pockets, fixings and other items affecting the concreting work, (iv) notes on specifications, finishes and all cross-references affecting the construction. The drawing provides the detailer with the layout and sectional information required to specify the length, shape and number of each type of reinforcing bar. Reinforcement drawing is part of civil drawing. It fully describes and locates all reinforcements in relation to the finished surface of the concrete and to any holes or fixings. A structural drawing is a type of technical drawing which depicts the design and working drawings for building as well as technological structures. It includes a plan or set of plans for the building or other structures. Structural drawings are primarily concerned with the load-carrying members of a structure. They outline the size and types of materials to be used, as well as the general demands for connections. They do not address architectural details like surface finishes, partition walls, or mechanical systems. The structural drawings guide in detailing, fabricating, and installing parts of the structure. Structural drawings are of three types namely (i) design drawings, (ii) detail fabricating drawings, and (iii) erection drawings. Structural detail fabrication drawing includes all the details needed for the fabrication of the structures. Electrical and electronic diagrams depict the elements or functions of electrical or electronic items using standard symbols and connecting lines or data in tabular form. These diagrams do not depict items to scale. They are design information drawings. They are of following types. The first type is the functional block diagram. It depicts the functions of the major elements of a circuit, assembly, and system etc. in simplified form. It is prepared to illustrate the functional relationship of major elements of an assembly, and system etc. It includes major circuit functions depicted by single lines, rectangular blocks, and explanatory notes or text. The second type is the single line diagram. It depicts the course of an electric or electronics circuit, or system of circuits, and the elements thereof using single lines, symbols, and notes. A single line diagram conveys basic information about the operation of the circuit, but omits much of the detailed information usually shown on schematic diagrams. The single line form of presentation provides for (i) simplified diagrams of complex circuits and (ii) diagrammatic representation of systems in which a single line represents a multi-conductor circuit. It includes (i) connections of major elements of a circuit represented by single line graphic symbols, (ii) the course of the main circuits (connection of major components) shown in the most direct path and logical sequence, and (iii) electrical characteristics which are essential to an overall understanding of the system. The third type is schematic diagram. It depicts the electrical connections and functions of a specific circuit arrangement without regard to the physical shape, size, or location of the elements. It is prepared to show the detailed design of a circuit and to assist in tracing the circuit and its functions. It can be prepared for any level of assembly and can include one or more levels. It includes (i) symbolic representation of each element in the circuit with the symbols interconnected to depict circuit paths, (ii) reference designations, (iii) values for such items as resistors, capacitors, and inductors, and (iv) standard type designations for such items as semiconductor devices, microcircuits, and electron tubes etc. The fourth type is connection diagram or wiring diagram. It depicts the general physical arrangement of electrical connections and wires between circuit elements in an installation or assembly. It shows internal connections, but may include external connections which have one termination inside and one outside the assembly. It contains the details necessary to make or trace connections involved. It is prepared to show the connection of wires and circuit elements at any level of assembly or installation. It includes (i) physical relationship of circuit elements and their connections, (ii) items identified by reference designations, (iii) clearly identified terminal arrangements, (iv) wires numbered for reference, and (v) wire and termination descriptions. The fifth type is the interconnection diagram. It depicts only external connections between assemblies, units, or higher level items. It is prepared to show the interconnections between units, sets, groups, and systems. It is prepared either as a wiring type diagram which shows each wire, or as a cabling type diagram which primarily shows cables but can also include wires. It does not necessarily show physical relationship. The sixth type is the wiring list. It consists of tabular data and instructions necessary to establish wiring connections. The wiring list is a form of connection or interconnection diagram. It is normally prepared for one or more related assemblies. It includes (i) location identification and termination methods for each end of wire, (ii) a description of each wire (e.g. type, size, and colour etc. ), (iii) connection of items with wire leads, (iv) material (wire, and sleeving etc.) and process requirements for connections, (v) reference to associated assembly drawing, connection diagram, interconnection diagram, or wiring harness drawing. The seventh type is the logic circuit diagram. It depicts the logic functions of a system at any level of assembly. It is prepared to (i) illustrate logic functions, and (ii) facilitate circuit analysis and diagnosis of equipment problems. It includes (i) logic functions depicted by logic symbols connected by lines which represent signal paths, and (ii) pin numbers, test points, assembly boundaries, and non-logic functions necessary to describe the physical and electrical aspects of the circuit. Special application drawings are of several types. These are described below. A wiring harness drawing specifies the engineering requirements and establishes item identification for a wiring harness (a group of individually insulated conductors, including shielded wires and coaxial cables, held together by lacing cord or other binding). It is prepared as either a detailed or simplified drawing. It includes (i) pictorial views, (ii) a wiring tabulation or reference to a wiring list which identifies wire numbers or colour codes, circuit reference designations, wire lengths, wire type and gauge, termination methods, and other related data, (iii) instructions for fabrication of the harnesses, minimum bend radii for conductors, and cross-references to the using assembly or installation drawings and associated electrical diagrams, (iv) parts list specifying parts (connectors, terminal lugs, etc.) and bulk materials required for the fabrication of the harness, and (v) applicable processes. A cable assembly drawing depicts an electrical cable assembly of defined length and establishes item identification for that assembly. It is prepared to describe power, signal, radio frequency, audio and general purpose electrical cable assemblies including both single-run and branched cables. It includes (i) dimensions and tolerances for overall length and breakout locations, (ii) identification of parts, bulk materials, and processes required for fabrication of the cable assembly, (iii) preparation of the cable ends, (iv) orientation and offset of connectors, (v) maximum diameter of cable, (v) minimum bend radii for wiring within the assembly, (vi) detail views of moulded areas, (vii) conductor lay patterns, (viii) identification band or other marking requirements, (viii) a wiring list, wiring diagram, or schematic diagram, (ix) finish, special assembly, and/or storage instructions and (x) test requirements. Printed board drawing sets consist of those drawings which define the configuration of printed wiring or printed circuit boards and assemblies. They establish requirements for assembly and test. A typical drawing set includes an assembly drawing, schematic diagram, master drawing, and may include an artwork master. It specifies the engineering requirements for assembly and includes (i) identification of parts, materials, and processes required for the assembly, (ii) electrical insulating requirements, (iii) reference designations, terminal identification, polarity symbols, and index marks, (iv) control dimensions, (v) jumper wires, (vi) requirements for identification and traceability marking, spot bonding, conformal coating, and masking, part mounting, support, and assembly, cleanliness, part orientation and polarity, electrostatic discharge protection, special solder plug, lead forming, and electric testing , (vii) solder mask, and (ix) reference document identification. A master drawing provides the complete engineering description of a printed board which includes (i) all dimensions and tolerances necessary to establish board size and shape, mounting hole locations, cutouts, and hole sizes, etc., (ii) un-dimensioned holes located by the conductor pattern and at theoretical grid intersections, (iii) minimum annular rings for conductor patterns surrounding terminal holes to control both hole-to-terminal relationship and registration between layers, (iv) minimum conductor width, spacings, and distance to board edges, (v) registration marks to assure proper alignment of patterns and marking masters on two-sided and multilayer boards, (vi) definition of the cross section details of multilayer boards, (vii) dielectrics thickness between layers of multilayer boards, (viii) raw materials and plating requirements, (ix) etch back allowances, (x) reference designation marking, (xi) maximum rated voltage, (xi) identification and traceability marking requirements, (xii) test points, (xiii) test tab requirements, (xiv) the shape and arrangement of conductor or circuit patterns, hole locations, and printed marking requirements, (xv) critical pattern features which may affect circuit performance, (xvi) views of conductor or circuit patterns and printed marking requirements, (xvii) applicable process specification, and (xviii) process allowances used in preparing the artwork master. Artwork master is a precision scale pattern on stable base material used to produce printed boards within the accuracy established by the master drawings and to establish and control the configuration of the conductor or circuit and marking patterns when these details are not included in the master drawings. A microcircuit drawing specifies the engineering requirements and establishes item identification for a microcircuit. It is prepared to establish the physical and functional characteristics necessary to ensure microcircuit interchangeability. It includes (i) outline and mounting requirements, (ii) performance requirements, (iii) schematic diagrams showing functional electrical elements of the microcircuit, (iv) marking requirements, (v) identification of input and output pin functions, and (vi) quality assurance provisions. An un-dimensioned drawing represents the shape and other design features of an object at a precise scale predominantly without dimensions. It is prepared to describe items which can be fabricated by use of the patterns to produce the item or to produce a tool for use in fabricating the item. It includes (i) information necessary to manufacture the depicted items within required design limits, (ii) an x-y coordinate grid or scale for dimensional verification of the drawing, and (iii) tolerance dimensions where greater or lesser control is required for specific features. A kit drawing identifies an item or group of items with instructions for their use. It does not necessarily define a complete functional assembly. It is prepared when it is desired to identify all of the items required to perform a specific operation in kit form. It includes (i) a parts list of the contents of the kit including the identification of each item, (ii) documents which are a part of the kit, (iii) pictorial representations, (iv) special tool requirements for installation of the kit, and (v) retest or recalibration requirements. A pipe bend drawing establishes, by pictorial or tabular description or a combination thereof, end product definition for a single, multi-plane, pipe or pipe assembly along with the identification for the bent pipe or pipe assembly. It is prepared to specify complete requirements and configuration of rigid or semi-rigid piping for direct use in forming on a draw bending machine. It is prepared as a detail, assembly, or detail assembly drawing. It includes (i) pipe material, (ii) end types, (iii) identification and quantity of fittings, (iv) dimensional requirements including bend radii, angles, intersection points, intermediate and overall lengths, and (v) other data necessary to define design requirements. A matched set drawing defines items which are matched and for which replacement as a matched set is essential. It is prepared when the required dimensions, tolerances, or other characteristics of items can only be specified in terms of the matched relationship. This includes items which are interchangeable only as a set because of special requirements for machining, electrical characteristics, performance, etc. It includes (i) physical or functional mating characteristics of the matched items (set), (ii) unique identifier assigned to each of the parts and to the matched set, and (iii) discrete identification marking of the matched set. A contour definition drawing contains the mathematical, numeric, or graphic definition required to locate and define a contoured surface. It does not establish item identification for the items described thereon. It is prepared to define complex surface geometry which cannot be conveniently included in the detail drawings of an item. It includes (i) mathematical equations for the geometric features, (ii) tabulated coordinates, (iii) graphic sections, and (iv) a summary of features and relationships to more basic coordinate systems in appropriate combinations to define the contoured surface or the desired points on a contoured surface. A computer program drawing describes the design details, establishes item identification, and provides for control of the software it represents. Three types of drawings are generally used. These are (i) computer program listing drawing, (ii) computer program assembly drawing, and (iii) computer program set drawing. Computer program listing drawing is prepared to document operational computer programs / software. It provides design details and establishes item identification for the computer program. It identifies the master source code, object code, or both, for the computer program in human readable form. The drawing specifies the media materials, marking requirements, and the applicable specifications. The type of software tools (computer, assembler, and compiler etc.) required to produce the object code from the source code is also specified. The computer program assembly drawing contains computer generated load maps of computer programs with multiple components / subprograms. It lists each subprogram and specifies the media materials, type of equipment required to produce the computer program, marking requirements, and applicable specifications. It establishes item identification for the assembly process. The computer program set drawing groups two or more individual computer programs into a set for handling convenience. It consists of a parts list which identifies the computer programs and applicable notes. It establishes item identification for the set. Modifying drawing types (altered item, selected item and modification drawings) are not used for items made from raw or bulk materials, items purchased in bulk lengths (extrusions, channel nuts, and hinges etc. ), or such semi-processed items as blank panels, castings, and electronic equipment drawers etc. An altered item drawing describes the physical alteration of an existing item under the control of another design activity. The drawing type permits the required alteration to be performed by any competent manufacturer including the original manufacturer, the altering design activity, or a third party. It establishes new item identification for the altered item. An altered item drawing includes (i) information necessary to identify the existing item prior to alteration, including the original item identification, (ii) complete details of the alteration, (iii) a unique identifier assigned to the altered Item, (iv) re-identification marking requirements, and a parts list when the alteration necessitates any additional items to produce the altered item. A selected item drawing defines refined acceptance criteria for an existing item under the control of another design activity which requires further selection, restriction, or testing for such characteristics as fit, tolerance, material (in cases where alternate materials are used in the existing item), performance, reliability, etc., within the originally prescribed limits. This drawing establishes new item identification for the selected item. A selected item drawing is prepared when it is feasible to select from an existing group of existing items those items which (i) meet the required characteristics for a particular application, and (ii) pass additional tests or inspections imposed by the using design activity for characteristics not normally specified for the original item. The selected item drawing establishes the detailed criteria on which selection of the item is based. A modification drawing describes changes to items after they have been delivered. When required for control purposes, the drawing requires re-identification of the modified item. The drawing is prepared to add, remove, or rework items to satisfy the user’s requirements or to incorporate mandatory changes in delivered equipment. A modification drawing is not a substitute for existing drawing types used to produce the item prior to modification. Engineering changes are incorporated into the latter drawing types to the extent that future production is to reflect the modifications. The modification drawing includes complete information for accomplishing the changes which includes (i) instructions for the removal or installation of affected parts, (ii) special notes, (iii) item identification of affected items prior to modification, (iv) effectivity of the items to be modified, (v) instructions for re-identification of modified items, (vi) dimensions necessary to accomplish the modification, (vii) a parts list identifying all items required for the modification, (viii) a list of special tools or equipment required, and (ix) instructions for disposition of unused holes, wires, removed items, etc.